To me, it is always with great sadness and regret that a trip must inevitably come to an end (unless you’ve had an awful time and you couldn’t wait for it to be over). One second I was in Beijing, standing in a beautiful, incense bathed courtyard of a Buddhist monastery watching shaven-headed monks offer their prayers, and the next second I was on a plane, heading back to highrise heaven, wondering where all the time went. Even though the Beijing Easter trip was short, I think I managed to see quite a lot, and certainly the most important sights. Not an hour was wasted — the only time I wasn’t on the move was when I was sleeping. This was also my first true solo trip/vacation, and travelling alone proved to be very good because you can do exactly as you please, when you please. That said, I also did enjoy chatting with a few other solo travellers, when the opportunity arose. 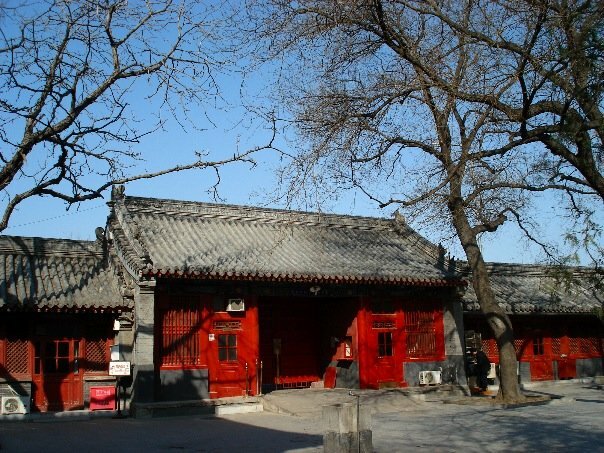 Beijing hutongs: This style of housing is the traditional courtyard structure for Chinese neighbourhoods — small, one-story buildings all connected by a tiny maze of alleys and walkways, often all connected so that it seems like a mini city inside. Unfortunately they have been demolishing the older hutongs in the run-up to the Olympics, even though I think tourists would rather see the old way of life than the new one…. The Forbidden City: Smack dab in the centre of Beijing is the Forbidden City, where the Imperial family lived in privacy and isolation from the rest of society for hundreds of years. It is incredibly massive — indeed a city of its own — and full of halls, courtyards, an endless number of rooms and various impressively large complexes. 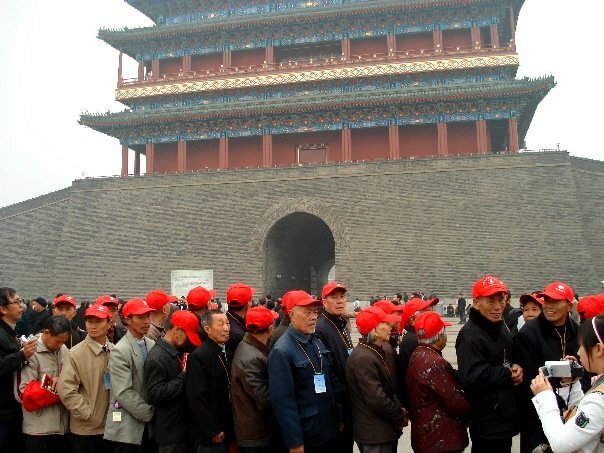 But to be quite honest it didn’t stand out as the best thing I saw in Beijing. It comes across as simply very big, very empty, and even a tad soulless. 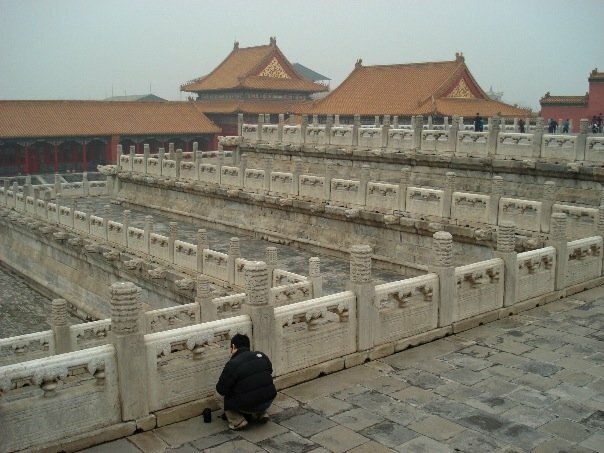 Inside the Forbidden City — wonder what it was like when it was inhabited? 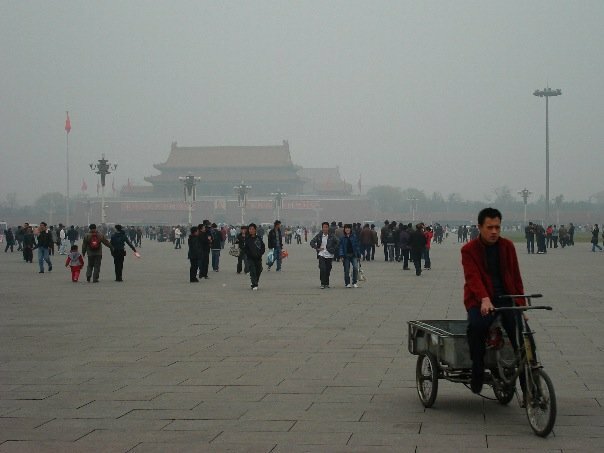 Tiananmen Square: Talking about big, empty and soulless, that’s also a pretty good description for Tiananmen Square. Of course, the first thing that will strike you about the picture above is how grey it is. That is indeed Beijing’s infamous air pollution. But if you look very clearly you can see the picture of Chairman Mao on the large gate which separates the Square from the Forbidden City. Mmm mmm. That’s some high quality smog, all right. Hack. 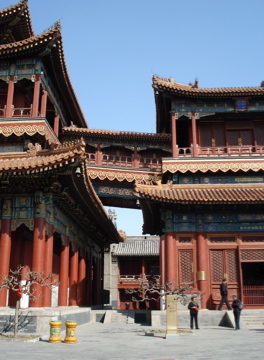 The Imperial Summer Palace: The royal family used to escape to the north of the city to their Summer Palace to enjoy the cool breezes and the scenic lake. Indeed it was quite lovely, and the feature that really impressed me was the Long Corridor, which is a walkway that goes along the entire lake front. 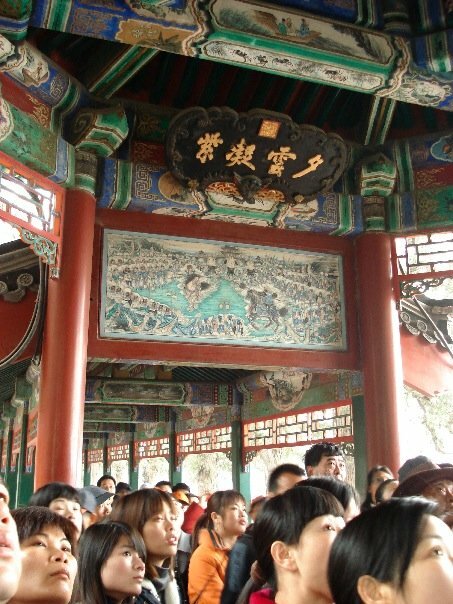 Painted on each wooden panel on the corridor is a depiction of life at the Summer Palace, or traditional Chinese folklore. I got some neck pain from peering up at the panels but they were so delicately painted, and with such detail. Peaches, crabs, flowers, hot peppers, birds, stories of great battles, and even a man instructing a dog. I wish I could have known all the stories. The Temple of Heaven: Considered Beijing’s most beautiful building, and rightfully so. 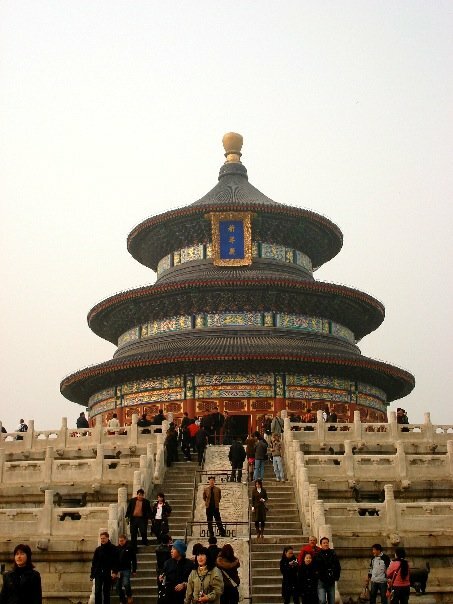 The Temple of Heaven’s architecture truly stands out from the typical rectangular style of Chinese temples. 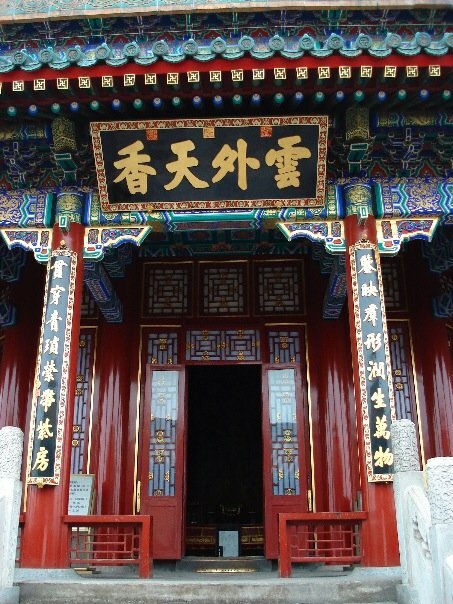 This beautiful wooden structure is also built with no nails, and was where the Emperor came to pray for good harvests. The style is highly symbolic — Earth was represented by a square while heaven was represented by a circle, so the temple and the surrounding grounds all symbolize the connection between heaven and earth. 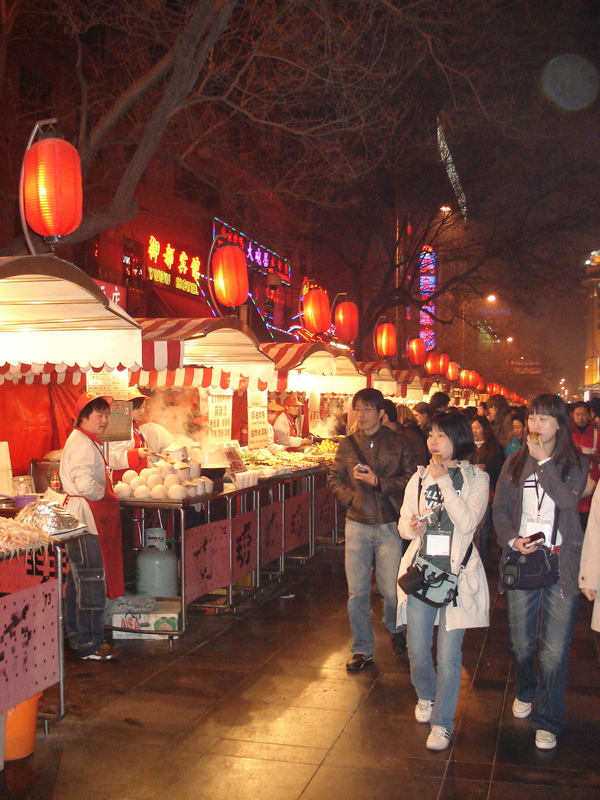 Wangfujing Night Market: This strip of stalls was selling everything you could imagine, such as scorpions, grubs, starfish, snakes, centipedes, ostrich (supposedly) and a variety of edible innards. Some of the tourists were trying to show off and eat something exotic but even the local Chinese were sticking to more ‘normal’ foods. It was good fun to wander around here, but I have a suspicion that they only serve these things to lure the tourists. So, those were the highlights inside the city. But without a doubt, the best part of this trip was the unforgettable experience of hiking on the Great Wall. On Sunday morning when I looked out the window I was shocked — all of the smog had cleared. It was a beautiful, clear, clean day. I was truly lucky. 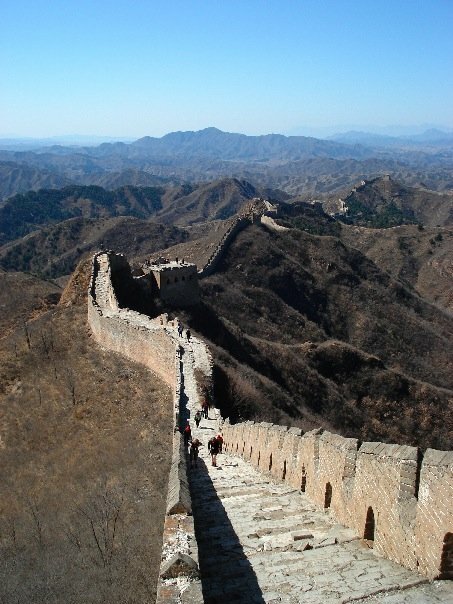 To read a detailed report about the hiking trip to the Great Wall, please click HERE.